So embrace the multifaceted deliciousness of real Italian food and don’t believe the myths. The only time this shows up in Italy is in a dish with shellfish or olives. Pepperoni is nowhere to be found on the Italian thin-crust creations. However, one will find thinly sliced potato, anchovies, sausages, prosciutto, mushrooms, fresh tomatoes, broccoli rabe and mozzarella. Plain bread with olive oil is the most prevalent in Italy. 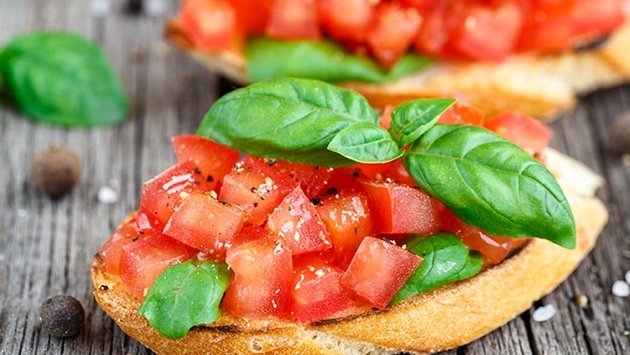 Bruschetta is actually the closest thing to garlic bread — an able substitute. These iconic cuisine items belong in two different courses, so they aren’t served together. Sorry. This does not exist in Italy, salads are dressed simply with olive oil, vinegar (balsamic sometimes), salt and sometimes pepper. Eggplant is the only food item that is prepared parm-style, nothing else. Fettuccine al burro (made with butter and cheese) is the closest dish to Fettucine Alfredo in Italy and it is far lighter than the heavily-dressed American cousin. Another case of combining two food items that are separate in traditional Italian cuisine. Chunks of fish over pasta is common, however. Created by immigrants to look like the Italian flag. Not found in Italy. Too decadent for Italian palates and not authentic. Go for cannoli, fruit tarts or pineapple to finish the meal. For more on real and not-so-real Italian cuisine, visit Collette’s blog.